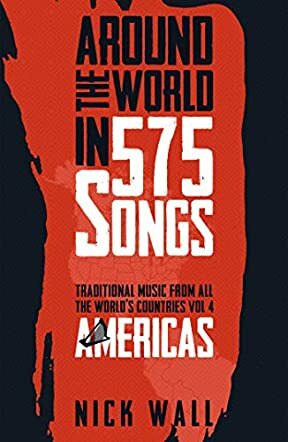 Nick Wall’s Around the World in 575 Songs: Traditional Music From all the World’s Countries—Vol. 4: Americas was an amazing experience. This wasn’t just a book, but a multi-media experience, as Nick Wall has a website with most of the music that he talks about in his book. The book is divided into 23 North American related countries and 12 South American related countries, often speaking about the music and composers of the countries with important political, historical, and cultural information interspersed. I found the best way to read the book is to have the website open and play the music as you are reading—it brings greater meaning to the information being provided by Nick Wall. His tone is enthusiastic and personal and I found some of the information presented to be fascinating and made me want to learn more about that country. The book is one of four volumes, which include Volume 1: Europe, Volume 2: Africa, Volume 3: Asia and Oceania, and Volume 4: Americas. In the Americas, the author has great enthusiasm for his subject matter and has gone through extensive research and interviewing during a four-year period to obtain a quality series of books which effectively introduces us to the countries and their music. Just the volume I read, Americas, showed a great deal of quotations referencing where he obtained the material. It is very relevant and up to date and includes the aftermath of Hurricane Maria in Puerto Rico and the issues of independence, which continue to be debated. It is an excellent music survey of 35 countries told through the context of their individual countries. As a survey, it introduces the music and story behind the music to the reader who may decide they want to learn even more about their country of interest. I will be interested in reading the other volumes of the series as a result. I highly recommend Nick Wall’s Around the World in 575 Songs along with the supplemental website to anyone interested in music of the world.